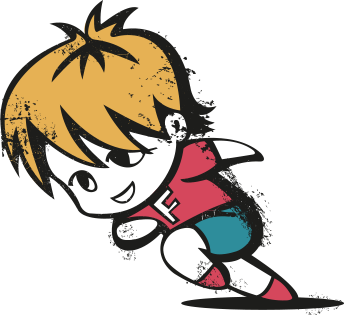 I sent out the email invitation and, almost by return, I had two volleyball teams. Then each team member texted or emailed to confide they’d never played volleyball or thought they might have played once, at school, a few decades ago. I realised I might be the most experienced player – and I last played at school. The prospect of corralling my Pals (not one of them known for taking instruction easily) into the rules and regulations of beach volleyball began to lose its allure. I’d been struggling to find a beach volleyball court in SE London and had begun to consider a daytrip to Brighton – which was, I’d been reliably informed, awash with courts. Then I spotted an ad. 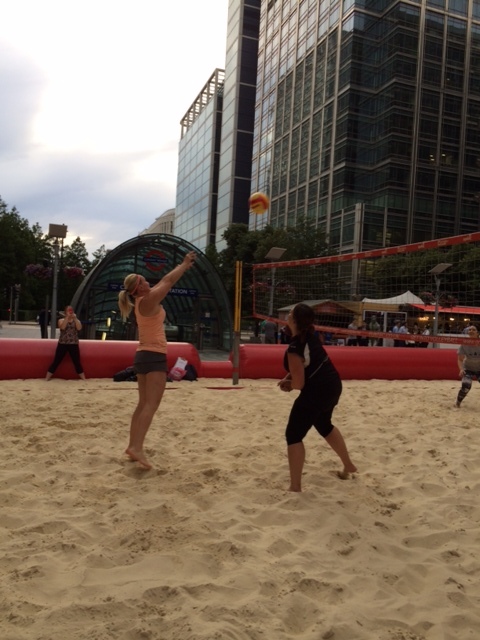 The excellent Action for Kids was holding its annual pop-up beach volleyball court competition in Canary Wharf and courts could be hired by the hour. I booked a court. Friday evening and the DLR delivered me to Canary Wharf. The bar near the volleyball court was doing good business. I said hello to the Action for Kids team, accepted a pair of sunglasses, and got changed in a wooden cabin – in the dark. While we waited for the Pals to arrive, a woman asked if she could join us. 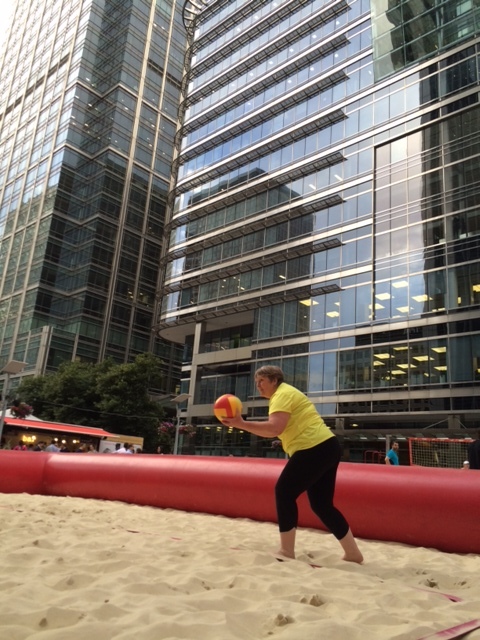 Soo-Bee had just finished work in Canary Wharf and wanted to play but didn’t have a team. I explained Freyathlon and warned her it could be a stopstart game. The Pals arrived and she still wasn’t deterred. After some debate we formed into teams and assembled on the court. It quickly became clear that the Pals didn’t lack power: one ball after another was hit into trees, drinkers, passersby. Security guards became ballboys and more than one of the Pals perfected the roll over the side of the inflatable court to retrieve a ball before it headed down the DLR escalator. 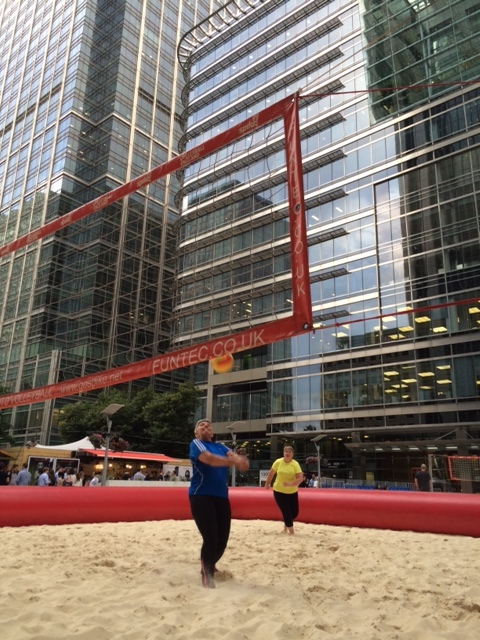 We may not have been expert volleyballistes but we were giving good entertainment. Soo-Bee called us together for some on-court coaching: ‘You’ve all got the strength. You need to control it not thump it.’ I was glad it was her saying it not me. The Pals listened. We practiced facing in the direction we wanted the ball to go and discovered it helped. We practiced crouching down so the ball dropped onto our hands and forearms and discovered we could pass and control it more easily. Soo-Bee got us back into teams. To manage the competitive streak, each team was allocated an Australian and an array of European nations made up the rest of the teams. Soo-Bee explained the scoring and it was clear she had played a bit and more recently than her schooldays (we discovered later she played regularly in a league). We paid attention, modified our service, and spent more time on the court than off it. 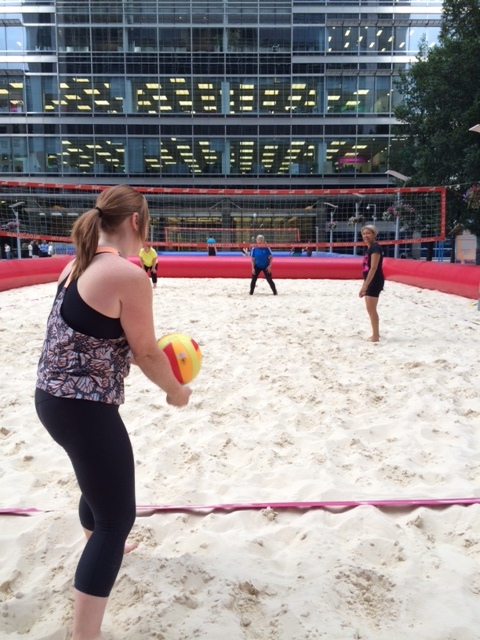 More serves went over the net, some were returned, the Pals dived in the sand and leapt at the net. We were Playing Beach Volleyball! We completed two full sets and the score was 1:1. Tension, or competition, was fierce. The next group of players were waiting to come on the court, and the pressure was on to complete the final set and declare a winning team. I held my serve for six points and we were winning. I lost my serve and the other team levelled on points. Our hour was up and we had to leave the court. We thanked the next group of players for using some of their time on the court, shook out the sand from our hair and clothing, and agreed it had been one of the best Friday evenings we’d had for a while. 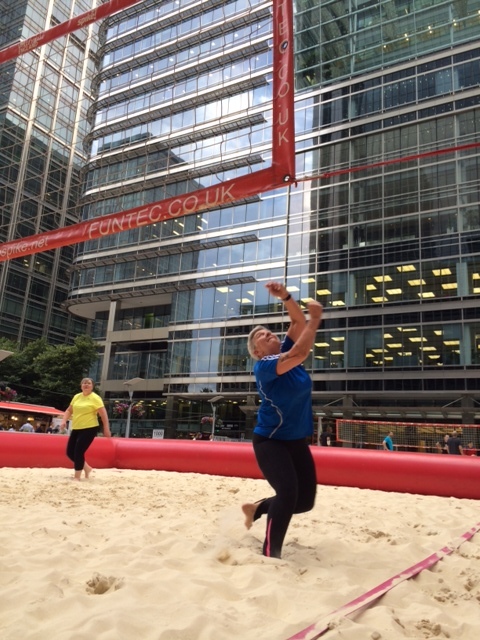 And I might just find a beach volleyball team to join after I complete Freyathlon.